Invasive species are among the three greatest threats to the environment worldwide, according to the International Union for Conservation of Nature. Species ranging from microscopic viruses to larger creatures like rodents and non-native fish can alter the balance of entire ecosystems. The threat is well-known in Puget Sound and the Salish Sea, which face their own unique challenges. This week, our magazine Salish Sea Currents looks at some of the ways that invasive species get into local waters. Senior writer Christopher Dunagan reports on two leading pathways that have caught the attention of regulators. Studies show that many invaders are literally shipped into our ports. They arrive as stowaways in ballast water, or attach themselves to the outer hulls of boats and ships, a condition known as biofouling. Despite this knowledge, there remain significant gaps in regulations of these two pathways. 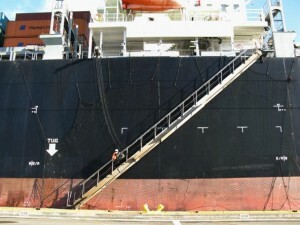 Most ships are required to exchange their ballast water in the open ocean, which offers some protection. But in the case of ships coming from the mouth of the Columbia River — a known hot-spot for potential invaders — ballast water can still be dumped directly into Puget Sound. Researchers worry that this could open the door for species of concern such as the green crab, or tiny crustaceans known as copepods that may already be interfering with the Puget Sound food web. The other major pathway, biofouling, is almost entirely unregulated. Officials are just starting to develop—and debate—plans to address these issues. You can read the entire series on the Encyclopedia of Puget Sound.